PSNResearch clinical systems: secure, reliable, and customized. TrialVista is the leading SaaS CTMS. Out-of-the-box your trial is online in days. Bespoke development upon request. Easy & ready-to-use, adaptable to all research industry studies. Transforming clinical development with data insights. Power your trial in the cloud. 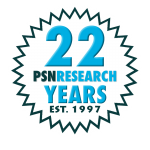 At PSNResearch, our mission is to efficiently and effectively support your enterprise. We could not do that without our world-class technology and elite levels of operational excellence. PSNResearch sweats the details so you don’t have to.